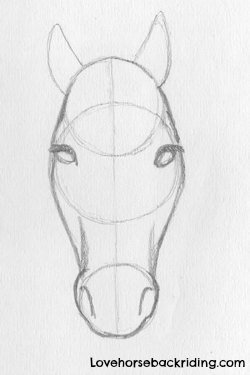 When working on horse pencil drawings such as the horse head series found here, adding more definite outlines and some details will continue to add life to your portrayal. By now, you have finished blocking out basic shapes and have started an outline. If you just came here, you may want to start from the beginning by clicking below. That way you'll know how we got through steps one through four. You will now start step five. You've worked hard. Now you can start adding more details and finalize the outline of your drawing. This finalizes the shape of the horses's head. Since you already have the top eye line, just complete it by drawing another bottom line in the same manner. The end result is that the eye should be an almond shape. Look at the picture above to see how they should lay. The ears are almost triangle shaped, but as you can see the outside line of each ear drawing has more of a curved shape. You can see the nostrils are made using another set of curved lines drawn as shown inside the widened circle. (vi) Add a little bit of shading to the two vertical lines coming up from the nose. This adds definition to the face. Shading in drawings means that you darken it a bit using more pressure or more lines with your pencil. Make a diagonal line starting at the right ear and going downward at a fairly steep angle as shown above. 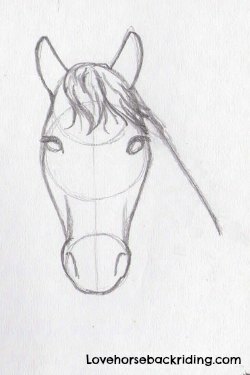 Add short curved lines between the ears for the hair of the forelock. These lines do not have to be neat as they represent the lay of the horse's hair. Some horse pencil drawings such as this example do not show a mane as it is brushed to the other side. You can draw yours however you would like to. Once you finish that, your drawing is almost done. There are a couple more steps left. You can always review the prior step if you need to, or move on to finish the tutorial.